Please forgive this photo — I was starving and sitting at my desk. Or just hold your hand over your screen. It really doesn’t do justice for this amazing soup. I forgot to pack a lunch yesterday, so I ran down to Bewiched and grabbed a cup of soup. So, what was this soup, you ask? 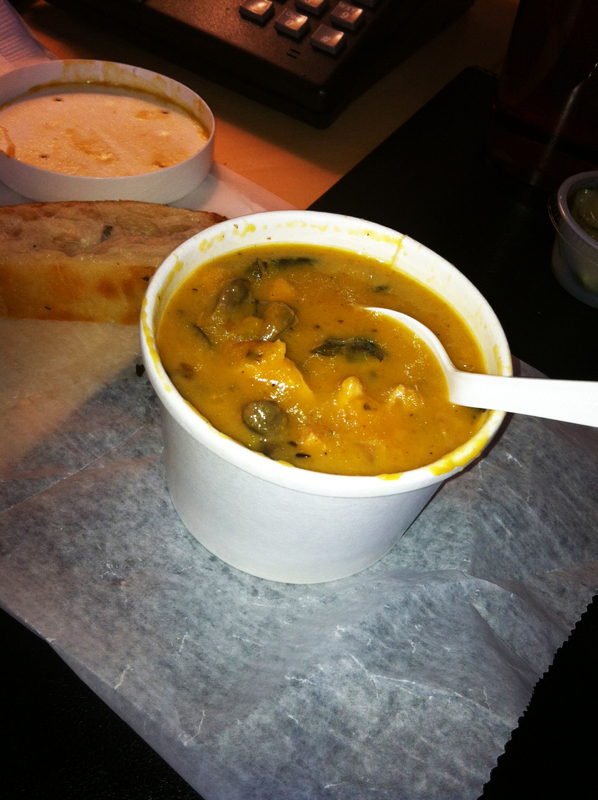 It was “Butternut Squash with Turkey, Roasted Brussel Sprouts, Sage and Mushrooms.” Got all that? As soon as I smelled it I knew it would be amazing. Seriously, Autumn in a Bowl. And it was. They turkey was thick and moist, and I could take the Sprouts, the mushrooms, the squash. I’m still thinking about it. I sure hope they have it today, too!